Join in the global movement to reduce ecological footprints at City Square Mall this weekend. As part of the mall’s commitment to environmental sustainability, lights of selected areas around the mall and other non-essential lights would be switched off between 8.30pm to 9.30pm. What's more? 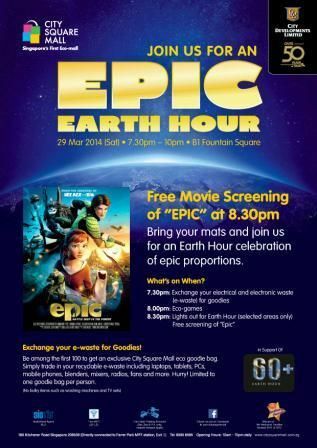 Free movie screening of 3D computer animated action-adventure film, Epic. So, head down to Basement 1 Fountain Square where all the fun awaits! For more details on the activities and promotions, visit www.citysquaremall.com.sg or check out City Square Mall’s Facebook page www.facebook.com/citysquaremall.